Singapore (Singapore 19, 2013) — ASUS has released the P1M Portable LED Projector, a multiple design award-winning projector that delivers bright, crystal clear presentations in a compact package designed for utmost ease and mobility. 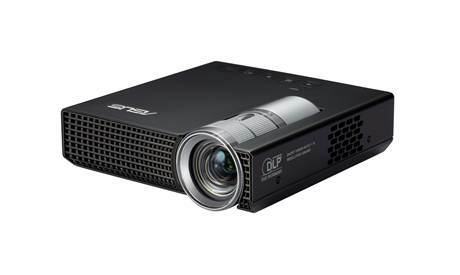 The ASUS P1M Portable LED Projector is rated at 200 ANSI lumens and projects visuals in HD 1280 x 800, so whatever is seen on screen precisely matches the original content viewed on a notebook or PC. The mercury-free Eco-LED light source used in the P1M has a lifespan of up to 30,000 hours. To put that into perspective, it would last for 20 years if the P1M was used 4 hours daily. The P1M does away with long warm-up times and can be quickly set up in as little as 5 seconds from power-up. There is no cooling down period required either, powering off instantly. An Auto Keystone Correction feature can detect the P1M’s orientation and automatically corrects distorted trapezoid images that result from an angled projection. This saves the user the time and hassle of having to adjust the image. With a short throw ratio of 1.16:1, users can enjoy HD projections the size of a 40” display if the P1M is just a meter from the screen. At this size, even 8-point fonts can be visibly seen and read clearly. The P1M enables instant height adjustments thanks to a flip-down stand that can be quickly adjusted to suit the task at hand; saving the user a considerable amount of time when compared with traditional adjustable screw-stands. The ultra-slim and compact P1M tips the scales at just 415g, and has dimensions similar to a CD case (W125.5 x H33.5 x L130 mm). It fits most small bags, making it ideal for those constantly on-the-go. To further lighten the load, it works with most ASUS notebook AC power adapters (≧65W). One notebook and projector sharing a single power adapter makes it the ideal business presentation combo that delivers the one-two punch in the boardroom. ASUS Design engineers penned the lines of the P1M with the user in mind, giving it the instant height adjustment flip-down stand and making it compatible with most ASUS notebook AC power adapters. Its internal thermal design and the use of highly thermal conductive magnesium alloys together increase cooling efficiency to ensure the P1M operates silently and rarely overheats. The P1M joins a long list of award-winning designs that come from the ASUS Design offices; it recently bagged the Good Design Award in Japan and iF Product Design Award in Germany.